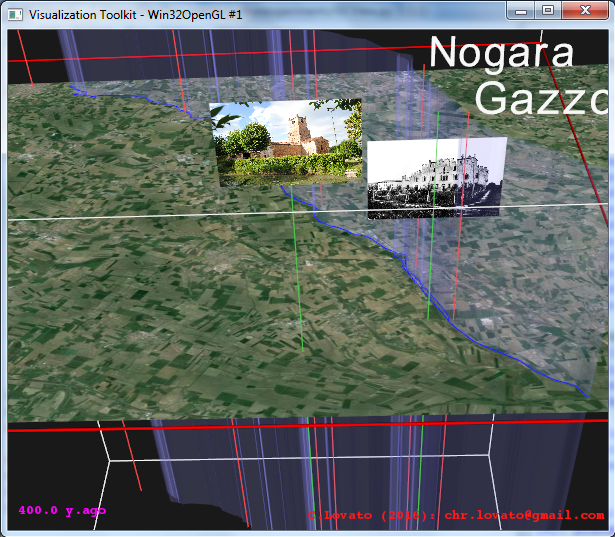 GCView allows to show events in a space-time environment, using Z-axis (height) as temporal axis. In a frame like this it's possible to show any kind of events, i.e. historical ones or recent ones, like the shoot of a photo, but also personal events, like birth and familiar events of specific people. My idea is to use a frame like this for saving of community memory, linking personal life of people with (pre)historical events that are happened in the same place but in different times. In this demo, is possible to see some placemarks (representing cities) with photos taken in different places and times, wiht a geographical object, a river, which extends in the spatial and temporal dimensions. Using historical geological data, we would see the rivers assume fashinating gemetrical folds as it changes its stream bed in time.